Tonight I made a Hanukkah dinner using a lot of eggs. Since a lot of it needed some time int he oven I'll tell the story in an artistic manner in the style of the new hit movie Memento! Last night was the first night of Hanukkah. I had to work late so tonight became our late Hanukkah meal. after spending an hour and a half stuck in traffic I only had an hour and fifteen minutes to put it together. Luckily I had shopped in advance and I am practiced so I was able to just barely pull off tonight's dinner by the time Jen's train got in. Salad was a breeze. A breezy cop out. 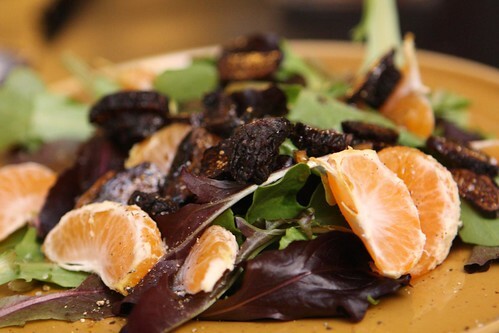 I just recycled the salad from the other night using the rest of Jen's salad dressing, some mixed greens, satsumas, dried fig, and pistachios. Before making the salad I made a batch of latkes with grated potato, red onion (for fun, I normally use sweet onion), horseradish, cider vinegar, flour, egg, green onion, salt, and pepper. 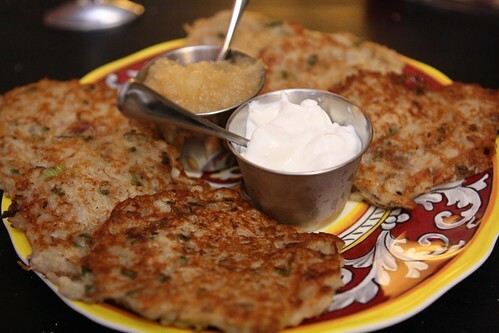 I fried them up in a pan with a little butter and served them with sour cream and fresh applesauce which I simmered while preparing dinner. 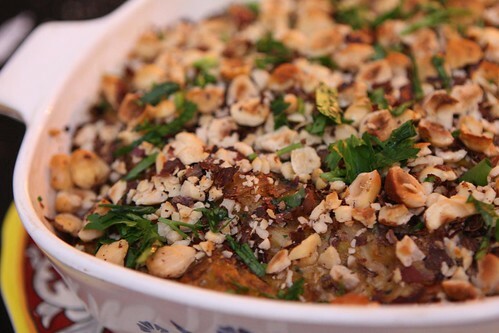 Before making the latke mix I had to prepare this kugel by boiling some cauliflower, carmelizing some leeks, mashing them together, then adding some egg and parsley then baking it in the oven with some crushed, toasted hazelnuts on top. This year Christmas and Hanukkah and Christmas overlap. This is the perfect excuse to alternate Hanukkah and Christmas beers! The problem is that there aren't really any Hanukkah beers that I know of. There is, however, a whole line of He'Brew beers from Shmaltz Brewing Company. 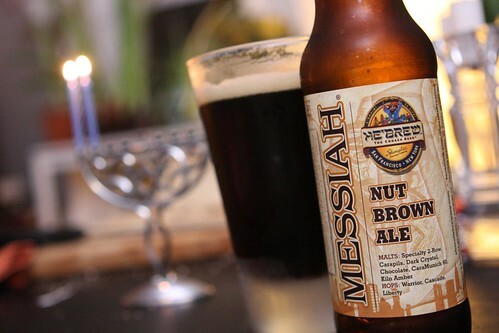 Tonight I selected their Messiah Nut Brown Ale to accompany this Hanukkah meal. This was more nut black than nut brown but it was nut delicious so it didn't matter. I was a little sad that I'd only purchased one bottle. It also made me wonder if this is anything like Newcastle as I haven't had that since the '90s. I'll have to have it again soon to compare notes. Yes, I take notes on the beers I drink. It is a source of great ridicule from some people, most notably Jen. The first thing I did when I got home was slice up a loaf of bread, cut it up, and soak it in egg nog with brandy, Benedictine, dried currants, toasted pistachios, and eggs. While that soaked I sliced up some D'anjou pears and carmelized them in a pan with brown sugar and butter. 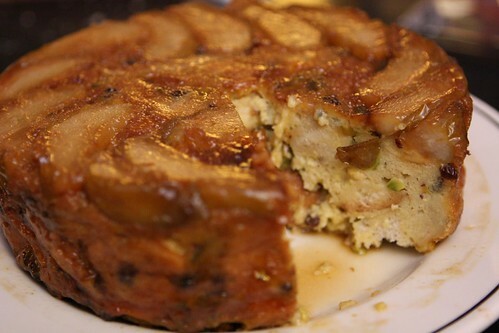 I layered the carmelized pear slices in a pan, topped it with the eggnog and bread mixture, then baked it in the oven before cooling and serving. Overall a lot of elements of this meal could have done with a little more time in preparation but the overall result was the best I could have hoped for. Now, if only I can figure out what all these tattooed clues on my arms mean.